2018 / Anniversary Scavenger 2018 - All cards! Hello and welcome to the second Anniversary Scavenger! In this game, you will be scavenging for a bunch of small collectibles, spread across this and other boards, and a few related places! This year's collectables are cards instead of last year's stickers! There are 75 in total to be found at the end of the month. Cards aren't just themselves placed large in plain sight. You will generally find them tucked away in a hidden, yet recognisable form. This form can, but doesn't have to look like the card itself. Examples include a smiley that looks slightly different, or Mario & Luigi-style beanspots. When you find one, simply click on it, and it will be added to your album. Additionally, it will be marked with a green spot when you return to it later. You will find them mostly on this board, but some will also appear in other boards, and even in The 'Shroom. Note that not all of them can be found yet, as cards will also appear within presentations on the ceremony or in future tournament game posts. For some you'll have to dig a little deeper as well. If it appears that some cards are not found as often as others, I will be giving out some hints to help find them. By default, you won't see the cards laying around. After you sign up here, you will receive a PM from me with an activation link to your album. From that point onward, you can go forth and catch 'em all! You can even click that link on multiple devices and/or browsers and you can continue there! You will get a personal album for your cards to review. You can access it after visiting the activation link in my PM. In this album you will find the cards sorted per category, and clicking on one shows a tattle and when you found it. If you've activated it in your browser, click here! Partial points are rounded up when totalled. * If one hides a spot and subsequently finds it first, they won't get both bonuses, and the one who finds it first after will still get the found first bonus. Hello there ladies and gentlemen! Welcome to the second Mario Kart 8 Deluxe Battle tournament! I am your host for the season, Lakituthequick! So how will this tournament go? Battles will happen in groups of up to 10 people, depending on the amount of sign-ups. The amount of people that will move on will also be slightly dependant on the sign-ups, but will most likely be 2 to 4. Currently, the planning for the MK8D tournaments to happen is from 30 July to 19 August, with the versus tournament first and the battle one after that. When specific people race is to be determined, also with availability and flexibility of the participants in mind. You will receive a survey prior to the event to indicate your availability in this period. Which Battles Modes will be used? The following modes will be used: Shine Thief, Balloon Battle, Coin Runners and Bob-omb Blast, in that order. One mode is used per round, so everyone in the same round will have the same mode. That means that if there are three rounds, including finals, Bob-omb Blast will not appear this year. Good observation. Renegade Roundup is the oddball because it requires teams, as well as having a scoring system that gives The Law an advantage even if The Renegades win. What are the battle rules? Battles will be without teams, with Normal Items. Rounds will be 4 minutes. On the course selection screen, you shall only choose for Random Course. How do we communicate during the battles? During battles, you are to join the IRC-chatroom #AwardsKart on DarkMyst. The easiest way to go there if you've never been there before is by going to Special:Webchat on the Wiki, and typing "/j #AwardsKart" once you're there. Don't hesitate to ask for help if needed. If it so appears that every participant has an account on Discord, I may create a server for this purpose. I will be in all battles to act as referee and note down the results as well. How do we connect in-game? While Mario Kart 8 Deluxe does have Tournament functions on its own, we shall not be utilizing those during the tournament. Instead, we will make use of the Friend Room functionality. This allows for more flexibility, longer lobby times and other things. Very simple, post below with the name on your profile, your friendcode, and your timezone (be mindful of daylight saving times). Hello there ladies and gentlemen! Welcome to the fifth Mario Kart 8 tournament, and the first Deluxe one at that! Races will happen in groups of up to 10 people, depending on the amount of sign-ups. The amount of people that will move on will also be slightly dependant on the sign-ups, but will most likely be 3 or 4. What are the racing rules? Races will be 150cc, with All Items. On the course selection screen, you shall only choose for Random Course. This does not apply in the ultimate race, where you instead have to choose the Rainbow Road that was predetermined by public vote. How do we communicate during the races? During races, you are to join the IRC-chatroom #AwardsKart on DarkMyst. The easiest way to go there if you've never been there before is by going to Special:Webchat on the Wiki, and typing "/j #AwardsKart" once you're there. Don't hesitate to ask for help if needed. I will be in all races to act as referee and note down the results as well. What happened to the Wii U version? Statistics have it that the Nintendo Switch version has already sold more units than the Wii U version did. The poll I held in May points out that an equal number of users have the Wii U and Nintendo Switch versions, but not all Wii U users also bought the DLC. Deluxe thus offers more users with access to all courses. Hi there! This topic is here to poll which versions of Mario Kart 8 people have, and to poll the interest for a tournament in these versions. Battles will be on the Nintendo Switch version. The outcome of this poll will aid in determining on which platform(s) the regular VS tournament will be held. 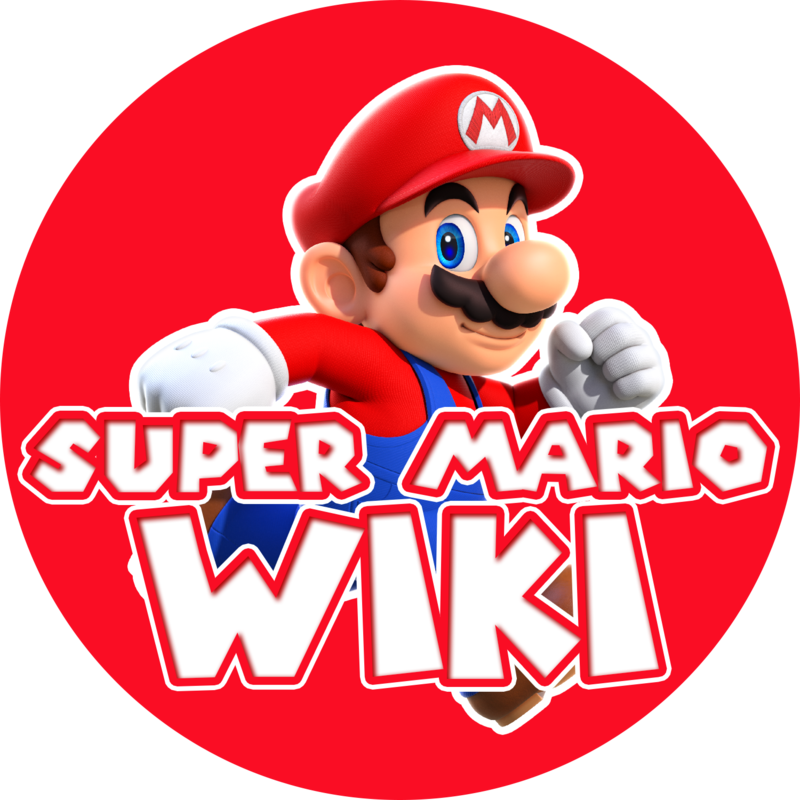 "Why not just do it on the Wii U as always?" Because statistics have it that the Switch version has already sold more units than the Wii U version did. I can't know for sure how the ratio is in these areas, so a poll is a handy tool to check this out. If you are not interested in a VS tournament, please vote the topmost option. Note: this is not a sign-up thread. Maybe it will be repurposed later on, but for now, it's just a poll. Suggestions are always welcome though. Because you can never be too early! If you sign up, please add some reference of your persona. Not required if you are >95% sure I still have one from the last several years. In which I post stuff I make. If I make stuff that is. Yeah basically whoever wants to cameo in one of my presentations. Except I don't need your sprites but I need a visual representation of your OC... Which could be sprites if that's fulfilling. 2017 / Anniversary Scavenger - All stickers! Hello and welcome to Anniversary Scavenger! The collectibles I call stickers, as that is what they resemble in your album. There are 50 in total to be found at the end of the season. Stickers aren't always just themselves placed large in plain sight. You will generally find them tucked away in a hidden, yet recognizable form. This form can, but doesn't have to look like the sticker itself. Examples include a smiley that looks slightly different, or Mario & Luigi-style beanspots. When you find one, simple click on it, and it will be added to your album. Additionally, it will be marked with a green dot when you return to it later. You will find them mostly on this board, but some will also appear in other boards, and even in The 'Shroom. Note that not all of them can be found yet, as stickers may also appear within presentations on the ceremony or in future tournament game posts. You may wonder, if they can be found everywhere, will it not be difficult or tiresome to find them all? Well, if I notice that a particular sticker isn't found that often, I may give a hint every now and again. By default, you won't see the stickers laying around. When you sign up here, you will receive a PM from me not too long after, with an activation link to your album. From that point onward, you can go forth and catch 'em all! You can even click that link on multiple devices and/or browsers and your progress will carry over! This is a low maintenance tournament, so you don't need plenty of time to participate. Half points are rounded up when totalled. * If one hides a sticker and subsequently finds it first, they won't get both bonuses, and the one who finds it first after will still get the found first bonus. Ladies and Gentlemen! Welcome to the fourth annual Awards Mario Kart 8 Tournament! We are your hosts, Lakituthequick and Freakworld! Currently, the planning for the MK8 tournaments to happen is from 1 to 21 July, with the regular tournament first and the battle one after that. When specific people race is to be determined, also with availability and flexibility of the participants in mind. You will receive a survey several weeks prior to the event. LTQ or Freakworld will be in all races to act as referee and note down the results as well. While Mario Kart 8 does have Tournament functions on its own, we shall not be utilizing those during the tournament. Instead, we will make use of the Friend Room functionality. This allows for more flexibility, longer lobby times, the optional use of the microphone and other things. Very simple, post below with the name of your Mii, your NNID, your timezone (be mindful of daylight saving times), and which DLC packs you have. I'd also be interested in 200cc, will you do that too? We have plans for that, but we would like to know how many people would be in for that before we continue to that. If you have interest, do say so! If you are not interested in this tournament, but are in a 200cc tournament, please do post here! 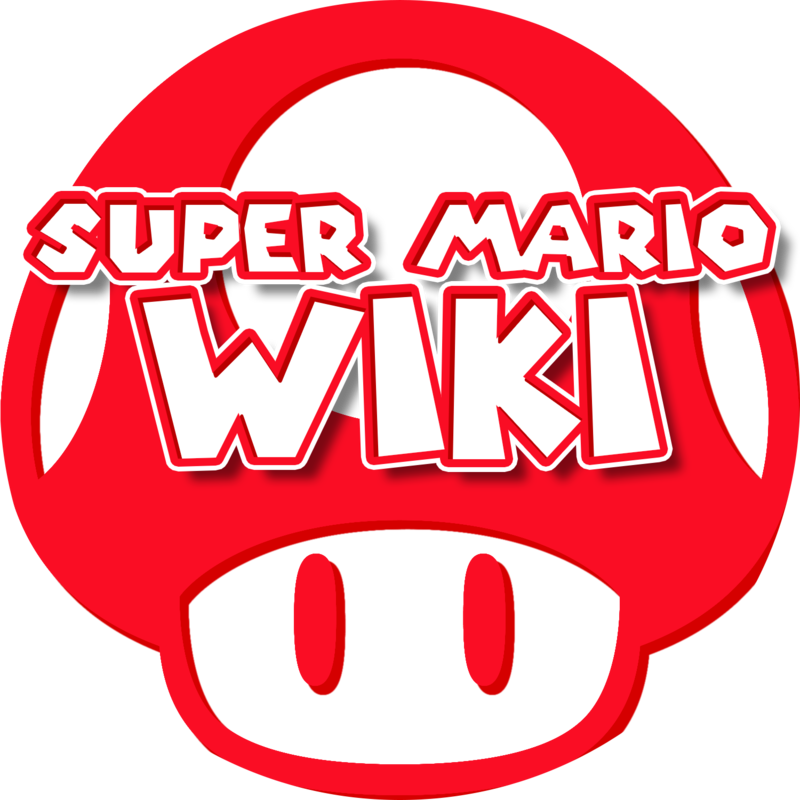 The logo is also a graphical asset of the wiki, but not a banner, will post here instead. Eldritchdraaks contacted me (and a few others) because he took a shot at redesigning the logo, but also doesn't feel for creating an account here just yet. Steve appears to give a liking for the second one. Personally I find them possibly a bit generic (or at least the second), plus I've noted the drop shadow at the bottom right as irregular. Question to people that may live in New York City. My mother and grandmother are visiting NYC later this year and we're looking at public transport and stuff. Would the MetroCard be sufficient for this or are there some hidden pitfalls I didn't find but we should be aware off? NYC Subway (line A) and AirTrain JFK are at least planned to be used. Gooood night/morning/afternoon/evening dear girls and boys! Welcome to the third Mario Kart 8 Tournament, hosted by moi, Lakituthequick! Currently, the planning is to have the tournament from 18 to 31 July. When specific people race is to be determined, also with availability and flexibility of the participants in mind. You will receive a survey several weeks prior to the event. While Mario Kart 8 does feature Tournament functions on its own, we shall not be utilizing those during this tournament. Instead, we will make use of the Friend Room functionality. This allows for more flexibility, longer lobby times, the optional use of the microphone and other things. On the course selection screen, you shall only choose for Random Course. This does not apply in the ultimate race, where you instead have to choose the Rainbow Road that was predetermined by public vote. Races will be 150cc, All Items. I will be in any race as a referee and to record Mario Kart TV footage, which will be uploaded to YouTube ''''soonish'''' after. DLC will not be required, but a note will be made about who owns which packs for maximum joy. Will there be something with 200cc? I'm planning something with 200cc on a smaller scale, yes, but that will come later. Where are the highlights from last year? Somewhere on my harddisk, in pieces. They'll come. Eventually. I think. Why is this section named "Frequently Asked Questions" while no questions have been asked yet? Because people were going to ask them anyway so I'll break the recursive laws of logic by making them unasked. Good day dear people of this planet. Welcome to the second Mario Kart 8 Tournament to date. My name is Lakituthequick, and I'll be hosting this Tournament. The races will happen from 20 July to 2 August. When specific people race is to be determined, also with availability and flexibility of the participants in mind. During races, you are encouraged to join the IRC-chatroom #AwardsKart on DarkMyst. The easiest way to go there if you've never been there before is by going to Special:Webchat on the Wiki, and typing "/j #AwardsKart" once you're there. Don't hesitate to ask for help if needed. On the course selection screen, you shall only choose for Random Course. This does not apply in the ultimate race, where you have to choose any Rainbow Road instead. I will be in any race as a referee and to record Mario Kart TV footage, which will be uploaded to YouTube soonish after. DLC will not be required, but a note will be made about who owns which packs for matchmaking, if possible. When signing up, please specify your timezone (abbreviation or a city in that zone, not just an offset), NNID, Mii name and which DLC Packs you possess. 2014 / Mario Kart 8 Tournament ☆ SKmarioman wins! Good day Ladies and Gentlemen. Welcome to the first Mario Kart 8 Tournament during the Mario Awards. I will join each race to act as a referee, but also participate as long as I'm not eliminated myself. And the winner of this year is SKmarioman! Being followed by Turboo, Crackin355, PrincessOfPeaches, Uniju and Yoshi K! 2014 / Mario Kart 7 Tournament ☆ Cirdec Wins! Well, I've build up the mandatory parts of the tournaments, which will both be mostly the same, except the amount of players per group (7 in MK7, 11 in MK8). Because MK8 will only launch in 6 days after this post, I'm not 100% sure how its online works with communities/tournament functionality, so that will be determined ASAP after it's release. Like last year, every round and groups will have their own community. Grouping the players will happen based on their timezones, though as the tournament proceeds, this might get tricky if for example there are only people from America, Europe and Oceania. That is something I simply can't predict, and I will place a disclaimer on that. I as host will join every race to act as a referee and note the scores. In MK8 we have MKTV though, so depending on it's functionality of being able to watch races friends play(ed) or not, I might not join those. On the side note, I want to participate the MK8 Tournament myself too, so while I'm not eliminated, the referee/MKTV part won't be a problem. Races are going to be at 150cc, all items. People have to select Random for every course. Should they fail to do so, I'll see if it brings consequences. As for Tokens, I took the schema from last year, and didn't change anything in it as it worked pretty well then. If one gets first or second, they get this too, not just one of above two. For MK7, I have picked the weekend of Friday 18 July to Sunday 20 July. For MK8 it is the week following that, 25 to 27 July. These dates are around the time the MK7 Tournament was hosted last year (which was 19-21 July). If there is anything I forgot or questions or additions, let me know. May as well. Last year this thread existed in January already. So I had plans in hosting Mario Kart 7 & 8 tournaments. I haven't set up solid plans yet, but I expect it to be similar to last year. MK8's online gameplay is still unknown at this point though. Anything on Wii (think MKWii/SSBB) will not be possible, since that is ending too soon discontinued. 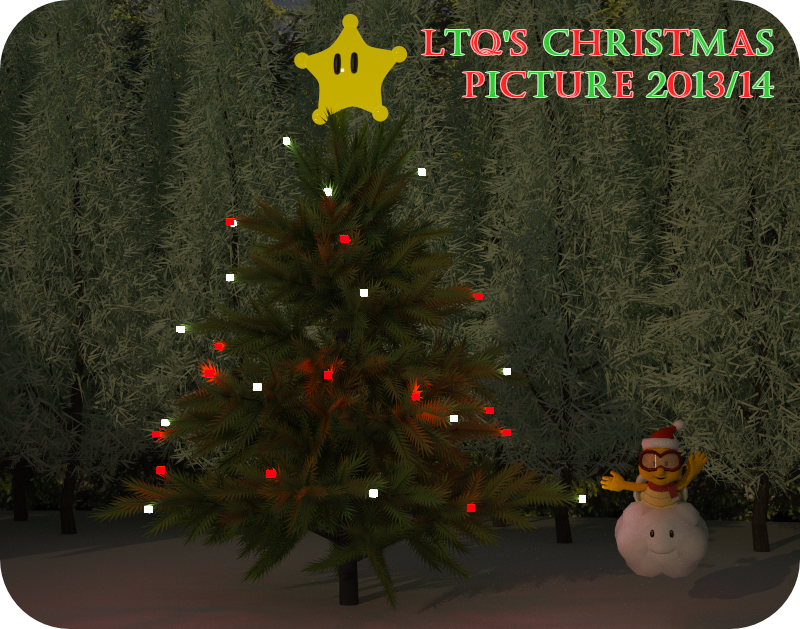 Fan Creations / LTQ's Christmas Picture 2013/14 ☆ Released! Yay indeed! After the great response of last year's edition, which is still viewable here, I decided to do it once again. For those unlucky people that weren't here last year, I'll give you a grip on the concept. 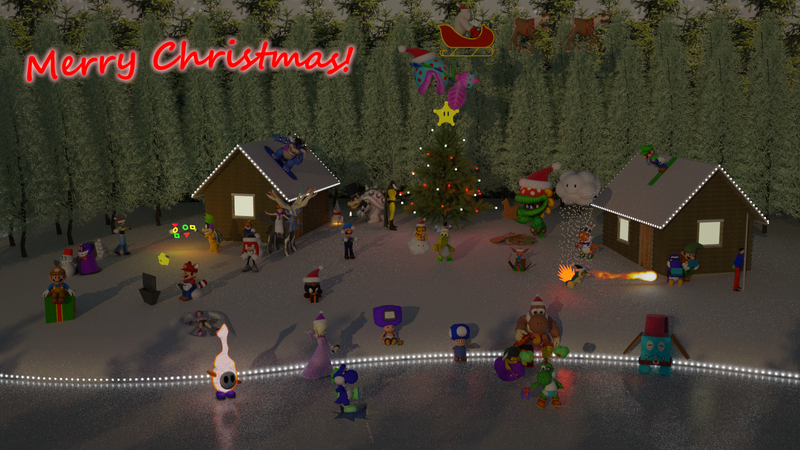 In this picture, I want to place various users OC's (Original Characters) in a three-dimensional environment. Different to last year, this won't be a group picture where everyone has to look at the camera. Instead, everyone can be doing some activity related to winter, Christmas, or both. There is a frozen stream outside of the view above where you can skate on ice, for example. And while there isn't a slope, you can do cross-country skiing. Whatever floats your boat! Of quite a lot of users I already have a 3D-model. If you where there last year, you don't have to worry, I have it. If you weren't there, can you please give a description or image of your OC in your sign-up? 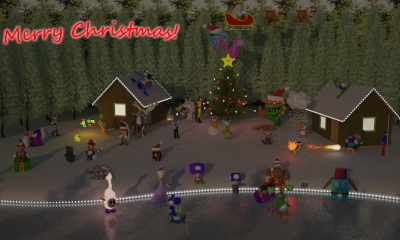 This of course is not necessary if you already made an appearance in my 3D images elsewhere. You may also give up additional props to wear if you want. Think about Santa-hats i.e. Without further ado, let the sign-ups begin! Sign-ups close in a week from now, or when 35 sign-ups are reached (not including me), whichever comes first. Yes, it's finished! For bandwidth reasons, I won't embed the image right here, but instead link it. To scan this QR-code with your 3DS, hold the L- and R-button simultaneously while in the HOME-menu, then press the checkered icon on the touchscreen. Names listed are of the rippers of the models. Original models are made by their respective game developers. Some licenses may apply, click to view. My father, for buying a Maxwell Render license for me. Can my comic be in the Awards this year? I hopefully get your quick response. Is this still possible and do others here agree? 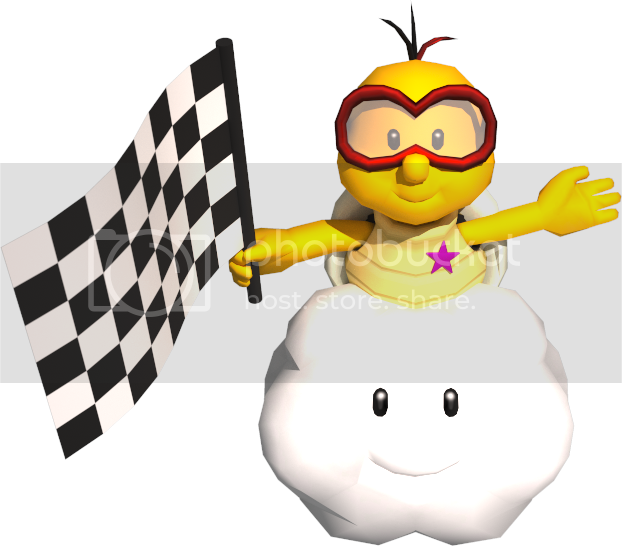 2013 / Mario Kart 7 Tournament #2 ☆ Cirdec wins! ☆ Thank you so much for to playing my game! 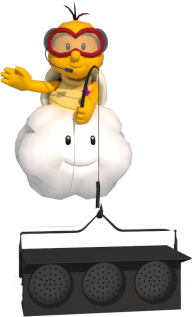 Hello there, and welcome to the Awards 2013 Mario Kart 7 Tournament. I am your host Lakituthequick, and over there *points off-screen* is PyroGuy6, my co-host. The times of the first Round will be determined based on the time-zone of the players. Depending on the amount of players, two or three Starting Groups will be made. It also depend on the amount of players how the following rounds go. Don't worry, it's all planned out. The date planned is 19 to 21 July. Unlike previous year, where the amount of sign-ups was locked on either 16 or 32 players, this Tournament can have any amount of players. I or Pyro will join each race to act as a referee, we won't participate.